"Electronics City" redirects here. For special economic zone in Kochi, see Electronics City, Kochi. Electronic City is an information technology hub in Bangalore, India, located in Anekal taluk. It is one of India's largest electronic/IT industrial parks, spread over 800 acres (3.2 km²) in Konappana Agrahara and Doddathogur villages in Bangalore. It consists of four zones called phases – Phase I, Phase II, Phase III and Phase IV. Electronic City was established by Keonics, Karnataka Electronic, a pioneer in information technology infrastructure development. There are approximately 200 IT/ITES companies located in Electronic City, which include main campuses of IT/Bio-tech majors Infosys, Wipro, TCS, HCL, Tech Mahindra, Biocon etc. Electronic City was the brainchild of R. K. Baliga, the first Chairman and Managing Director of Keonics, Karnataka Electronic. He dreamt of making Bangalore the Silicon Valley of India when he developed the concept of Electronic City. In 1978, Keonics established Electronic City on 332 acres of land in Konappana Agrahara and Doddathogur villages. The liberalisation of the Indian economy in the early 1990s by the then Indian Prime Minister P.V. Narasimha Rao and then Indian Finance Minister Dr. Manmohan Singh helped Electronic City to become what it is today — the outsourcing capital of the world. In 1997, the maintenance and upkeep of Electronic City was handed over by Keonics to ELCIA, the Electronic City Industries Association, with representatives from units in the enclave, for effective local governance and management. Security is provided by ELCIA, who have deployed around 500 security officials and also installed CCTV cameras on strategic locations. On 18 March 2013, a notification by the Urban Development Department has brought Electronic City Phases I, II, III under the E-City Industrial Township Area. Electronic City has well developed infrastructure in terms of connectivity to other important localities of Bangalore City. The four-lane mixed corridor elevated highway from Silk Board Junction to Electronic City was opened on 22 Jan 2010. The 9.985 km long expressway is one of the (second) longest elevated national highway in the country. This elevated stretch, promises to help a commuter reach Electronic City from Silk Board in less than 15 minutes. The NICE road connects Electronic City to other key areas in the west of Bengaluru city like, Bannergatta Road, Mysore Road, Kanakapura Road and Tumkur Road. This is a 63 km 6-lane access controlled tollway. Electronic city comes under the Namma Metro yellow line (R V Road - Bommasandra line). The project is expected to complete in the year 2022. The Heelalige railway station, about 4 km from Electronic city phase 2, has become part of the Bengaluru Suburban Rail (Bengaluru Commuter Rail) system. The South-Western Railways has introduced a fleet of Diesel Multiple Units (DMUs) on this route. Helicopter Taxi Service to Bangalore International Airport was launched in March 2018. Travelling time to / from Electronic City is 15 minutes. ^ "Infrastructure of Electronic City". Keonics. Archived from the original on 21 July 2011. Retrieved 11 February 2011. ^ a b "Keonics web site". Keonics. Retrieved 11 February 2011. ^ "Traffic jams a norm on Electronic City flyover". 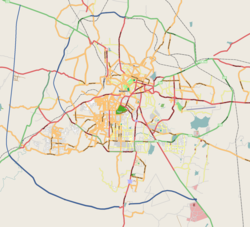 Wikimedia Commons has media related to Electronics City.